Be the first to share your favorite memory, photo or story of Shirley "Pete". This memorial page is dedicated for family, friends and future generations to celebrate the life of their loved one. 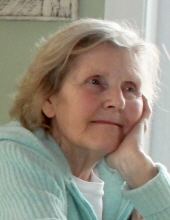 Shirley J. Jensen, age 83 of North Branch passed away on Thursday, February 7, 2019 at Ecumen North Branch. Shirley was born Nov. 22, 1935 in Elrod, South Dakota to parents Peter and Martha (McElroy) Peterson. She grew up in Henry, South Dakota and graduated from Henry High School, class of 1954. Shirley moved to Minneapolis and began working for the phone company as a telephone operator. She married Eugene M. Jensen on October 21, 1955 and they started a family, eventually moving to a hobby farm in Stark. Shirley, or “Pete,” as many knew her, enjoyed gardening, playing cards and games, music, and spending time with her family. She had a strong faith and was a member of Fish Lake Lutheran church. She enjoyed being a volunteer at the church, North Branch Senior Center, and Meals on Wheels. She was known for her sweet and gentle nature and will be deeply missed by her close friends and family. She is survived by her children, David (Jennifer) Jensen of Fridley, Cindy (Nick) Koslowski and Cathy (Mike) Rudquist of Red Wing; brother, Ken Peterson of Crystal, sisters, Irene Deal of Watertown, S.D., Marion Coplan of Watertown, S.D. and Darlene Olson of Deerwood; her six grandchildren, Luke Koslowski, Holly (Tom) Maeckelbergh, Ken Koslowski, Jackson and Julia Rudquist and John Jensen; great grandsons, Dominic and Charles Maeckelbergh. She is preceded in death by her husband, Eugene in April of 2016; sisters, Alice Ness and Gladys Grinde and brother, Ray Peterson. To send flowers or a remembrance gift to the family of Shirley "Pete" J. Jensen, please visit our Tribute Store. "Email Address" would like to share the life celebration of Shirley "Pete" J. Jensen. Click on the "link" to go to share a favorite memory or leave a condolence message for the family.